of which didn't get done! As it happens the first day of 2013 is my regular day to write for this blog so I thought why not just wish all my readers a very Happy New Year! May this year be your best yet for life, love and the pursuit of happiness! Traditionally this is the time of year where I completely overlook making any New Year resolutions because you can make resolutions anytime - no need to wait for New Years. That said, this year I've come the closest I've ever been to making an actual New Years Resolution. I spent some of the last day of 2012 listing all the projects I have wanted to complete since 2010 and decided I'm going to get them done by the end of 2013. Sounds an awful lot like a New Years resolution doesn't it? Some of the projects I've been wanting to get done since before 2010. 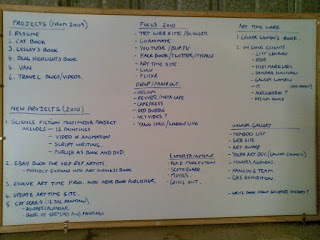 They made the cut because I had them written on a white board, as part my goals list for 2010, that still sits in my garage (see the image above). I'm not going to list any of the projects here or even promise to get them done - don't want to jinx it (whatever that really means?) 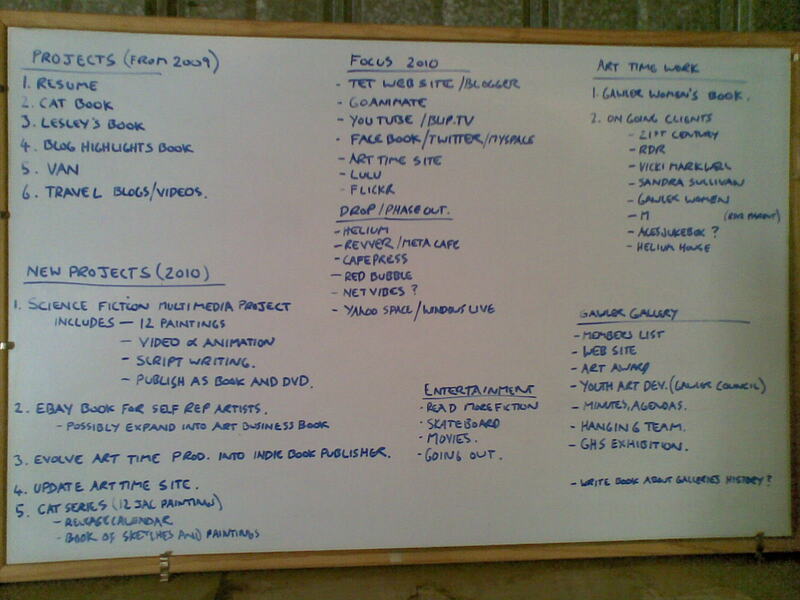 but just know that I'm heading into the new year with a bunch of projects and the resolve to get them done... and there's quite a few more than just those written on my whiteboard in 2010. To give you a general sense of what's ahead I plan to do much more painting than I have in the last three years. I hope to release at least one or two self published books. I also hope to be doing more of my own animations along side all the business ones I've been doing to earn a living. The one thing that I plan to keep doing consistently is write for this blog and my Animation and Video blog every Tuesday and Wednesday. I consider both to be a part of my working week and essential in reminding me that I do have my own things to work on too. Clients can't always take priority. (I wouldn't have clients if I hadn't focused on my own projects and interest in animation). So that's my 'almost' resolutions for 2013. I'm hoping this year will be one of my most prosperous yet. How about you? I'm not surprised you didn't get that lot done - it looks too overwhelming when you see it listed like that! You have to put it in sizeable chunks - small chunks! I'm not running a business, but I usually think what I'm going to do next day, be it getting something done,or not very much - by plan, as then you don't feel guilty if you didn't plan to do very much. If you're running a business then you'd have to have some sort of organisation as if you're going out to work if you're working from home, but take tea breaks and lunches and have your week-ends off, or most of it ie: if you want to work the occasional Saturday morning. I usually ask myself at the end of the day, 'What have I achieved today?' and tick off in my head. Most days I've got done most of what I wanted to do, even if they are only small things - I like to think that I've achieved something - unless I was planning to not do much, and do something that I actually want to do for ME this day! If I've been busy for say three days in a row, then I feel justified in having a bit of a day doing nothing much, only what I feel like doing, except for the usual things in the house that have to be done each day etc. I wouldn't put it in front of you all at once like that - if you must - put it in a notebook of 'Things To Do' but don't list too many - break it down a bit. It's better to know that you've achieved something in your day than trying to achieve large chunks! I know it's different when you're running a business but you know what I mean, keep it sizeable unless you're meeting a deadline, but try not to have those, give plenty of time instead. That's just my thoughts, but just to know that you're achieving something each day towards any goals is good. I don't really believe in goals - I just do as I go, and if I don't get it done, then, there's always another day! There has to be enjoyment in life too - it's not all about goals, unless you've promised some work for someone, which has to be done of course. The board is a list of projects planned for a whole year. It never looks daunting to me because the list is really so I don't forget things that I'd like to do at some point. I never hold myself to completing everything within a set time. It's more of something for me to refer back to when I don't have paid work to occupy my time. I put the list on a board so I can see it and be reminded about it. Things in notebooks are easy to ignore and forget about. It needs to be where I can see it every day. Oh, well, we all have our own system so if it works then use it. Where did 'doing Mum's book' come, as I don't see it down? :-) Was that just a spur of the moment thing that got pushed in? Nice of you to take the trouble to do that though, and a nice surprise. Something must have inspired you. I always wondered what happened with Lesley's book after the pictures, or maybe it was waiting for her to do some writing on it. I'd forgotten about it, but I think I came across the artwork on your site once. Your book was something I didn't foresee at the time this board was written (which was before we moved to Willaston). The book wasn't spur of the moment though. It was really cool to see my own writing as a book and I figured you'd get a kick out of it too. By that time you'd sent me more than enough samples of your writing. Lesley's book got shelved due to creative differences over the style of the characters. I lost my enthusiasm for it after that as illustrating Children's books is something I never had much interest in to begin with.